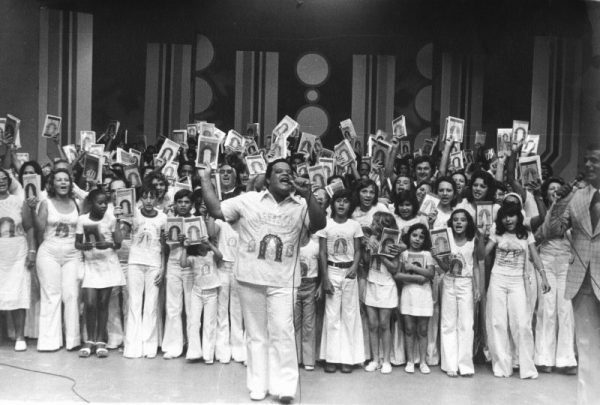 In today’s post, Allen Thayer discusses the history and influence of Rational Culture, a cult that heavily influenced Tim Maia and his music, and shares a story of meeting with two of the cult’s followers in Brazil in 2016. In my effort to tell the most comprehensive story yet about Tim Maia’s Rational adventures, I figured I better go straight to the source and learn more about what Rational Culture is all about. In my book, I explain the origin of Rational Culture and a bit about its founder (see: “Interlude: Seu Manoel & Rational Culture”), but I don’t really talk about where Rational Culture is now. So here’s some further reading for those of you who would like to know a bit more about Tim’s time in Rational Culture and what a couple of Rational Culture adherents think about this legacy. 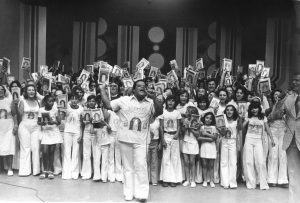 Tim Maia appears on Mauro Montalvão’s TV Tupi show on September 7, 1975. Accompanied by dozens of Rational Culture followers. Photo courtesy of Paulinho Guitarra. Before diving into this, I want to provide a 1,000-foot view of Rational Culture, as best as I can: Rational Culture believes that human beings are not from this planet, they are from a universe beyond our sun, a superior world in the realm of the Superior Star. Humans were banished (or left) here on earth, but our destiny is to return to our mother planet, which, like our extraterrestrial brothers of origin, is “pure, clean and perfect. Eternal, without defects.” Basically, the earth is wretched, filled with animal and magnetic energies, which are harmful to humans. Rational Culture, as a way of life, aims to purify oneself of those earthly, animal and magnetic energies through a process referred to as “Rational Immunization”. This process mostly consists of reading and rereading the thousand volumes of the Universe in Disenchantment series. 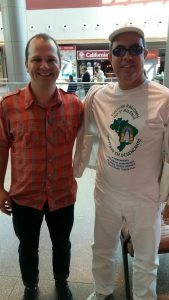 During my June 2016 research trip, I set up a meeting with Raphael, the same person who responded to my brief and direct request to interview someone and maybe visit the original Belford Roxo (satellite city of Rio de Janeiro) headquarters while visiting Brazil. Raphael runs the website for Rational Culture. “I’ve been a student of Rational Culture for 30 years, starting in 1986. I met Seu Manoel and my mother knew him well from his time in Belford Roxo,” said Raphael. I asked if there was anyone still alive and following Rational Culture that would remember Tim’s short time in and around Belford Roxo, to which he responded, “[it’s] unlikely that someone is still alive from that time with Tim Maia.” We decided to meet anyway while I was visiting Brazil and settled on a Tuesday morning in Barra Da Tijuca, a southern suburb of Rio de Janeiro in one of a few mega malls along the main commercial thoroughfare. Meeting in the morning in front of the closed Cinemark movie theater on a few low-slung lounge chairs, I talked with Raphael and his Rational Culture colleague, Christine, for an hour and a half, about all things Tim Maia Rational. I’ll refer to Raphael and Christine by their first names only, per their request. It was the most difficult interview or language experience of my entire life, considering my less-than-fluent Portuguese and the esoteric and complicated vocabulary that Rational Culture is riddled with. L-R: Allen Thayer with Raphael, June 2016. Photo courtesy of the author. …this book was made by an inhabitant of the Rational World and dematerialized by Seu Manoel Jacinto Coelho. So, what happened was that all of the knowledge that Seu Manoel dictated from the Rational Superior’s transmission, he published it, materializing Rational Energy in the words, in the subjects of the book. When you look at the book and begin to read, this other inhabitant inside the words reverses the process and dematerializes his Rational Energy that the reader absorbs. We call this process: Development of the dematerialization of the inhabitant of the rational world. Beginning in 1969, just before Tim Maia joined, Coelho began rewriting these three volumes, which were written in “more erudite Portuguese, that you could read, but the ideas were very condensed and it could be hard to understand,” Raphael explains. At 1:20am the morning of July 16th, 1978, so the legend tells, Coelho completed the three sets of twenty-one books that would replace the original, compact, three-volume set. Somehow between 1978 and 1991 Coelho managed to dictate another 934 books, to bring the total to 1,000 books. There’s a lot to absorb and emulate in the 1,000 volumes of Universe in Disenchantment. “Rational Culture,” Raphael explains, “doesn’t dogmatize things. There are no rules telling you what to do. What does the book do, it explains to you what’s good and what’s bad and you choose.” Evidently the books contain the answers to it all, you just keep reading and rereading the thousand volumes until you find what you’re looking for. Aside from learning first hand about the ins and outs of Rational Culture, I learned this tidbit, which no other Tim Maia scholar likely knows. When Tim appeared with his Rational caravan on Mauro Montalvão’s TV show towards the end of his time in Rational Culture, he was holding up a copy of the book Universe In Disenchantment, presumably his copy. Looking closely at the picture Raphael and Christine know it to be the fifteenth volume. 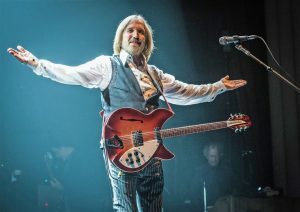 “He read the book until the fifteenth volume, but in some of his lyrics there are topics that don’t appear in the first fifteen volumes,” Christine says, “so we in Rational Culture are certain that Seu Manoel enthusiastically influenced Tim’s lyrics. For example, “Supermundo Racional” from Tim Maia Racional Vol. 3, has things that are from the historical volumes [one of the 934 books coming after the first 66 volumes].